I walked up to the Arch of Triumph and was expecting to be able to climb to the top. However as I got up close I noticed that the whole thing was covered from head to foot in scaffolding. Oh well! I only had one night in Bucharest on the way back home on my 'Silk Road' trip, but even in that short time I did get a good look around the city. Bucharest is an interesting city - there's a tiny bit of the old city that manage to survive Ceausescu's demolition ball, but a lot did get taken out. 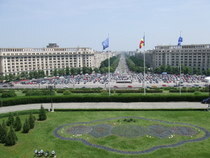 I guess the most famous building in Bucharest is the People's Palace. In fact since the revolution that over threw Ceausescu it was renamed 'Palace of the Parliament'. I paid my entry fee and made it inside the building. I had to make it through the usual security to get into the building, and what a building it is. Just about everything about it is big. Only the Pentagon is bigger. A lot of the fabric of the Palace of the Parliament was sourced from with Romania. The strangest thing is that the building isn't built all that well, and some of the fixtures and fittings have a very old world feel to them. Downtown there is a great building where a modern building has been built inside the facade of a much older building. The bottom two floors look normal, but a glass tower immerges from the roof and climbs another three floors or so. It's a eye catching building.